Christians believe that Jesus climbed steps on his way to the judgement hall in Pontius Pilate’s palace. These same steps were preserved and later restored. As a gift to the Holy See in 326 A.D. from Constantine the Great (orchestrated by his mother, St. Helena), the steps were relocated from Jerusalem to their current site at the Basilica of St. John Lateran in Rome. This artifact is among the holiest relics of the Roman Catholic Church. The set of 28 white marble steps is encased in a protective wood covering. Worshippers believe the stairway is holy because of Jesus’ footsteps on it. Indeed, pilgrims are only allowed to ascend on their knees. This kneeling position allows them to gaze through holes in the wood which allegedly reveal spots of Christ’s blood on the marble beneath. 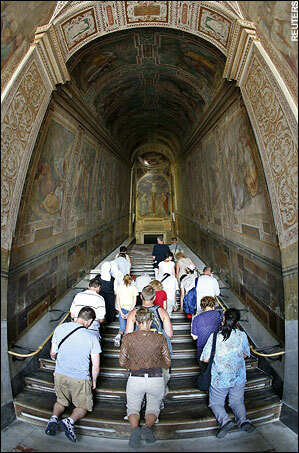 Several popes have undergone the ritual of ascending these sacred steps on their knees. This entry was posted in Uncategorized and tagged 28 steps, 334 AD, ascend stairs on their knees, Basilica of St. John Lateran - Rome, Christianity, church, climbing stairs, climbing stairs on knees, Constantine the Great, death sentence, forgiveness of sins, Holy See, Holy Staircase, holy stairs, indulgence of sins, Jerusalem, Jesus Christ, Jesus Christ's blood, Jesus's footsteps, Jesus’ trial before Pontius Pilate, judgement hall, kneeling position, marble steps, papal sanctuary, passion of Jesus Christ, pilgrims, Pontius Pilate, Pontius Pilate's palace, pope, recitation of prayers, relic, restoration, ritual, Roman Catholic Church, Rome – Italy, Saint Helena - mother of the Emperor Constantine, Scala Pilati (Pilate's stairway), Scala Sancti (holy stairway), steps, tradition, veneration. Bookmark the permalink.